This podcast was recorded several years ago for the first Evolution of Medicine Summit, and provides a wealth of clinical pearls and practical tips on today’s endocrine-driven chronic diseases. And if you’re hungry for more information and best practices in functional endocrinology, click here to join us for this month’s Functional Forum: Evolution of Endocrinology LIVE from Minneapolis, MN. Will you be in the Minneapolis area Monday, September 10? Click here to get 2 free tickets to the LIVE show using the coupon code “Dutch”, courtesy of our sponsor: Precision Analytical. This week’s podcast features: Daniel Schmachtenburger, co-founder and director of research and development at Neurohacker Collective, in Complexity Medicine: The Basis for a Functional Standard of Care. Daniel is a deep thinker and researcher on how human regulatory systems function, how they break down and how they can be supported to function with greater resilience. This was a fantastically dense half-hour of clinical insights, theory and tips...so grab your notebooks (hang onto your hats), listen and subscribe to the podcast today. This Evolution of Medicine Podcast, Coaching and Functional Medicine: A Match Made in Value-Based-Care-Heaven, features KNEW Health’s Director of Coaches and the founder of The School of Applied Functional Medicine, Tracy Harrison, MS.
Tracy first appeared on the Functional Forum with her “Future of Functional in Five: Health Coach Keys to the Future” in December 2016 (watch it here). In this interview, Tracy talks about the value she’s seen in KNEW Health’s experiment of creating a new practitioner: the physician-supervised functional-medicine trained health coach. If value in medicine is outcomes divided by cost, then the functional medicine-trained health coach could become the most valuable provider in medicine. Want to learn more about how health coaches could help streamline your practice? Click here to listen and subscribe to the Podcast today. Dana appeared on the very first Functional Forum in a comedy sketch with our co-founder, James Maskell, called: Think Pink. Her groundbreaking new book is all about how women’s source of self-worth leads to the formation of their health and lifestyle behaviors. If you’re a woman, or a practitioner who sees women in your practice, be sure to listen, and subscribe to the podcast today. This week’s podcast features Sarah Morgan, MS, “The Gene Queen” and author of the new book: Buddies in my Belly: A Story About Probiotics. In the podcast, James interviews Sarah about her fantastic new children’s book on the microbiome and her mission to make complex, medical topics easy to understand for children all ages. This book is one of our founders, James Maskell’s, favorites to read with his daughter, and it will be available in the Merch Store on the kNew Vision Tour this summer. Whether you’re a parent, grandparent, parent-to-be, practitioner, teacher, child caregiver or health advocate, this book is a must-have for educating the next generation. Learn more about the buddies in your belly by listening and subscribing to the Podcast today. This week’s podcast features: Dr. Mat Boulé, DO, posturologist and educator in Posturology: The Missing Link in Root Cause Resolution. Functional medicine practitioners are trained to look at health from the inside out, but Dr. Boulé has shown often you have to look from the outside in when to comes to specific conditions. This week’s Podcast serves as a perfect example of why we need our whole community to help patients resolve chronic disease, MDs, DOs, DCs, PTs, and more. Discover the power of addressing complex issues from the outside-in by listening and subscribing to the Podcast today. This week’s podcast features our accountability group manager Nicole Villamora on the success of our Practice Accelerator’s Accountability Groups. With spring enrollment in full-swing (and coming to an end April 27, 2018), James interviews Nicole on why the accountability groups have become a sought-after feature of the Accelerator, and why these group members are crushing it when it comes to practice development and marketing. At EvoMed, we’re all about harnessing the power of community to accelerate our movement forward---these groups were created in that same spirit (and they cost a heck of a lot less than hiring a personal business coach). Open enrollment in the Practice Accelerator is on through April 27, 2018. To learn more, click here to download the program brochure. This week’s podcast features professional athlete, explorer and 2X record-holder Colin O’Brady in: Overcoming Massive Odds to Change the World. While we typically feature doctors and experts from within our industry on the podcast, Colin’s background, story and mission run in perfect parallel with our kNew vision for American healthcare. Those of us who have answered the call to evolve the future of healthcare know what it feels like to be up against all-odds. But, if stories like Colin’s teach us anything, it’s that our cause is nowhere near impossible and we can all do more to change the world. This week’s podcast features Darrin Ingles, ND and author of the new book: The Lyme Solution: A 5-Part Plan to Fight the Inflammatory Auto-Immune Response and Beat Lyme Disease. It’s been almost 4 years since we’ve featured Lyme Disease in our content, and its prevalence has only increased―with cases popping up all over the world. Despite the growing prevalence of Lyme Disease, there are very few practitioners―integrative or otherwise―who understand how to detect it, diagnose it and address its insidious symptoms and co-infections at their roots. Whether you’re a practitioner or patient, the information in this show will help you better understanding Lyme Disease and the most effective, up-to-date therapies to help you beat it. Where Do CEOs Go for High Performance? This week’s podcast Where Do CEOs Go for High Performance continues our theme of employer health. In this show, we feature Dr. Ronald Brown, MD and his CEO Seth Conger of Carolina Healthspan Institute in Charlotte. Dr. Brown and team have created a unique Bredesen-style brain health protocol combining functional medicine and neurofeedback; which has flooded his practice with high-performing CEOs, executives, athletes and business owners. High-performers like employers, executives, CEOs and athletes are hungry for cognitive health programs like this...get an insider-look at how Dr. Browns’ model could help take your practice to new heights. As Dr. Scott’s story proves, a simple movie night can have an incredible ripple effect on a single practice and the functional medicine movement as a whole...when done right. In this week’s podcast, James interviews our COO and Chief Marketing Technologist Uli Iserloh, PhD on the top 5 things he learned from last week’s Functional Medicine Success Summit. Presented by Dr. Peter Osborne, this summit was headlined by our industry’s top practice development experts including Razi Berry, Dr. Sachin Patel, Dr. Matthew Loop and more. The biggest thing we learned: with the massive demand for functional medicine upon us, practitioners can no longer afford to “just wing it”; you must have the right systems, support and strategies in place to thrive. Wondering what do to next? Schedule a free practice assessment with an EvoMed concierge here and discover the best next-steps for you. Want to go deeper? Check out our on-demand training here and learn Uli’s recommendations for optimal website set up and effective automated email marketing. In Part 2 we welcome back Benicomp Insurance CEO Doug Short to explain how their new product, IncentiCare® makes functional medicine coverage accessible and affordable for all employees, not just CEOs, executives and business owners. If you got excited about the new patient potential outlined in last week’s podcast, you’ll be jumping out of your seat over what Doug has in store today. It’s time to act like we’re winning, because a whole new world is about open up for our ecosystem via IncentiCare. If you would like to support our efforts to make FxMed accessible to millions, we’d love to hear from you about local employers or business owners who could be a good fit for IncentiCare®. Tell us about them by clicking here. In this week’s game-changing podcast: “Meet the Health Insurance CEO Who Loves Functional Medicine”, James interviews Benicomp Insurance CEO, Doug Short on how functional medicine practitioners can now serve the approximately 200 million Americans receiving insurance through their employer, without cutting rates or changing practice models. This is the kNew era of medicine we’ve been talking about… and it’s here waiting for you right now. And be sure to tune in next week for Part 2, when Doug lays out how Benicomp can offer this type of functional medicine coverage for all employees (not just high-level executives and business owners). If you’re a practitioner: Click here to enter the names of the CEOs, business owners, HR managers and executives you’ve been seeing for the last 4 years and enter them on the podcast page. If you’re a patient and/or business owner, CEO, HR Manager, etc interested in getting functional medicine covered for your employees: click here to enter your contact information. Our goal in procuring these names, is to meet with these decision makers who already see the value in functional medicine for themselves and show them how they could reap the benefits of affordable, consistent functional medicine for all of their employees. Please forward it to all your colleagues who could benefit. This week marks the fourth anniversary of the Functional Forum! In our debut 2014 episode, we featured a bright young integrative psychiatrist, Dr. Kelly Brogan, who went on to blow the lid off the mental health world with her controversial, NYT-best-selling book: A Mind of Your Own. Two years later, James invited Kelly to be part of a new podcast series entitled: “Leaders of the kNew School”, showcasing women physicians leading the charge to a kNew type of feminine-focused, intuitive medicine. Join your host, James Maskell and NYT Best-Selling Author and holistic psychiatrist Dr. Kelly Brogan, to learn what this kNew era of medicine is all about. No matter what nutrition philosophy you recommend, nearly everyone agrees fasting or cleansing is beneficial to healing. But…how to guide your patients safely and successfully on a practitioner-led fasting program is no small feat (especially considering how many people suffer from chronic conditions). If you struggle with uncertainty about implementing fasting programs in your practice then this week’s podcast: Prescribing Lifestyle Medicine: The Power of Fasting is the tutorial you’ve been looking for. Join your host, James Maskell and fasting expert Dr. Felice Gersh, on how to safely run a clinical fasting program that gets results. Mastering the art of practitioner-directed fasting takes prescribing lifestyle and functional medicine to a new level...the key is knowing how to do it effectively and safely. Click here to today to learn how. In this week’s podcast we return to our “Success Leaves Clues” series: “Bredesen Protocol in Alabama”, featuring functional neuropsychologist Dr. Kristine Lokken, CEO and founder of Brain Health Institute in Birmingham, AL. “I’m living a dream I didn’t know I had”―is the quote that defines this podcast. Dr. Lokken didn’t know she wanted to be an entrepreneur or a functional medicine doctor until she came across Dr. Dale Bredesen and Kelly Brogan’s work, discovered the Evolution of Medicine book and enrolled in the Practice Accelerator program. From there, she implemented what she learned to establish Brain Health Institute, and realized entrepreneurship provided the life and freedom she had always dreamed of. Success like this can happen in any city and any state. Thousands of patients have bought Dale Bredesen’s NYT-Best-Selling book: “The End of Alzheimer’s”. Like Dr. Lokken, you can be ahead of the curve to deliver that type of care in your home town, and the Practice Accelerator can help you get there fast. This week’s podcast: “James Maskell Exposed: Lab Testing Functional Style” features our good friend Dr. Jeff Gladd MD Medical Director at kNew Health, interpreting our co-founder James Maskell’s functional lab results on-air. For patients: To help demystify the world of functional medicine and inspire listeners to get out there and get these life-changing functional labs done. Plus, we will air James’ re-test results, after he’s had a few months to follow Dr. Gladd’s advice to improve his markers, so stay tuned for that! And be sure to check out Dr. Gladd and James’ newest venture kNew Health, a membership-based program aimed to provide functional medicine at an accessible and affordable rate. Whether you’re pro-vaccine, anti-vaccine or unsure what to make of it all you owe it to yourself to listen to Dr. Thomas’ insights and findings on the current vaccine schedule and chronic pediatric ailments, like autism (the elephant in the room). StoryTime: "A Gathering of the Tribe"
As a holiday message from the Evolution of Medicine community, James Maskell reads "A Gathering of the Tribe" by Charles Eisenstein. This story speaks to our vision of community and the collective vision of our team, practitioners and mission. This week’s historic podcast: “Individualized Diets, ALCAT, and BMJ Gastroenterology” features the results of a brand-new study published in the British Medical Journal, validating food sensitivity testing (the ALCAT Test®) for IBS patients. The study named, “Efficacy of Individualized Diets in Patients with Irritable Bowel Syndrome: A Randomized Control Trial” was led by the late Dr. Ather Ali, ND a colleague of our co-founder, James Maskell, who sadly passed away this October. It is our great pleasure to honor Dr. Ali’s legacy by helping spread the word about his incredible research. In this podcast, James interviews another of the study’s lead researchers: Dr. Wajahat Mehal, professor of medicine at Yale University, for the inside scoop on this ground-breaking study. This week’s podcast continues our “Success Leaves Clues” series on “From Motherhood to Micropractice” and features Dr. Michelle Sands aka “The Metabolic Mama”, a Naturopath and functional medicine practitioner from Vermont and member of our Practice Accelerator program. Dr. Sand’s story is an inspirational one for women and men who struggle with balancing running a practice and being an active parent. She achieved this seemingly insurmountable goal, by implementing what she learned in the Practice Accelerator to set up a virtual dream practice targeting mothers. Today on the Evolution of Medicine podcast, we go back to the first Evolution of Medicine Summit with Dr. David Perlmutter, a renowned neurologist, brain health expert, and best selling author. He joined us to speak about the ever important, gut brain connection. We review this presentation in preparation for the upcoming Functional Forum - The Evolution of Neurology where will be bring you the best highlights from the Institute for Functional Medicine Annual International Conference. Can you create a Blue Zone? The 64000 person question. This week on the Evolution of Medicine podcast, we're thrilled to welcome back Marc Winn. Marc is a resident of the nation-state of Guernsey and the co-founder of the Dandelion Project whose mission is to make Guernsey the best place to live by 2020. On this podcast we will be announcing our most expansive and exciting adventure to date, called Journey to 100. It will be held on June 30th and available for live streaming through the Functional Forum. You might remember Evolution of Medicine co-founder James Maskell presented his TEDx talk in 2015 from Guernsey called Community, Not Medicine, Creates Health. He's heading back to Guernsey to host the event, along with Dr. Rangan Chatterjee, the BBC’s "Doctor in the House". Journey to 100 will host 20 leading global healthcare, lifestyle and longevity experts, who will share their perspectives and help us all understand how we can live healthier, happier lives, from zero to 100 years old and beyond. Expect over 20 international speakers from all over the world including some past Functional Forum presenters like Dr. Janet Settle, Dr. Michael Ash, Tom Blue and Dr. Sachin Patel. Beyond progressive medicine models, there will also be talks on fascinating topics indirectly related to healthcare like sustainable farming, universal basic income and community support structures. We believe this project has the potential to show the world how factors such as community, purpose in life, preventative healthcare and a proactive approach to well-being could make Guernsey the first country to have an average life expectancy of 100, and to kickstart a new era in health and longevity. For more information about the Guernsey 100 project, visit journey100.org. This week on the Evolution of Medicine podcast, we are thrilled to welcome start of the BBC one prime-time series and International Functional Forum host, Dr. Rangan Chatterjee. Dr. Chatterjee is a Functional Medicine doctor who is passionate about lifestyle transformation. Over 4 million people watched season one of Doctor in the House as he reversed type two diabetes and a number of other chronic conditions.
. He shares some of the tough cases he encountered. Once case in particular, he manages to help a patient with chronic cluster headaches. We also talked about what else to expect on the show and what you'll learn. Make sure to listen to the end, because we'll be announcing a special collaboration between the Functional Forum and the International Functional Forum for our summer episodes. 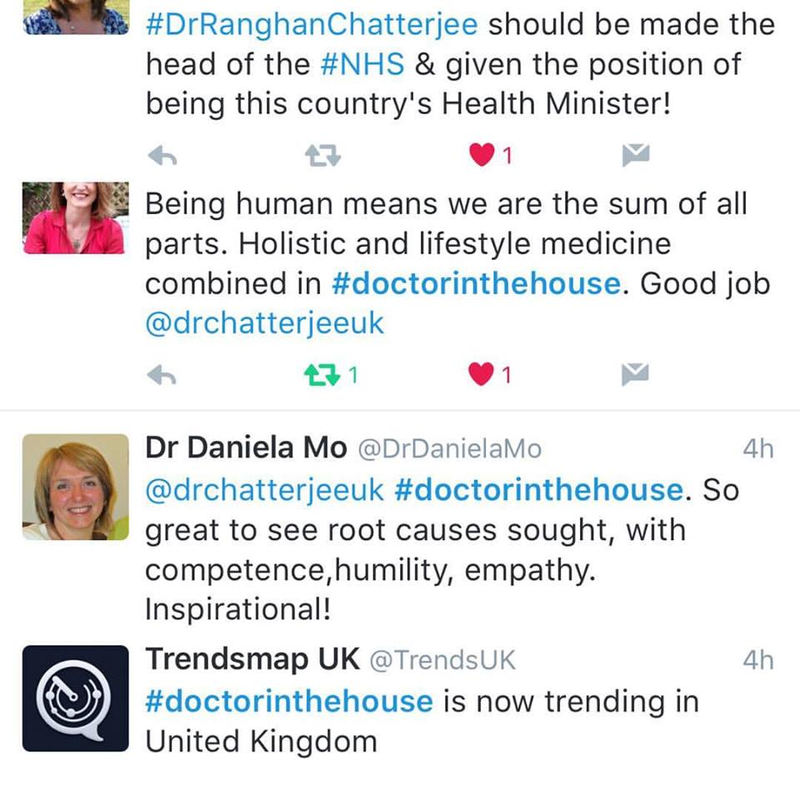 Here's some feedback from some fans of Doctor in the House! This week on the Evolution of Medicine podcast, we feature Steven Feyrer-Melk, PhD, co-founder of a preventative cardiology practice, The Optimal Heart Center and Chief Science Officer of Nudge Coach, a lifestyle medicine technology company. Nudge has sponsored the Functional Forum and the Evolution of Medicine podcast in the past year and has worked with us to bring our community of practitioners a valuable addition to their practices that allows every patient to feel supported at all times. Why is the time in between visits so important? How does this differ from Dean Ornish style cardiology clinic? How does technology work to play a role in facilitating, organizing, and streamlining processes to create behavior change? We tackle these questions and more during this powerful 30 minutes. Let us know what you think! To learn more about Nudge Coach, visit goevomed.com/nudge. This week on the Evolution of Medicine podcast, we're thrilled to welcome Danny Iny, the founder of Mirasee. Danny is a serial entrepreneur and has been involved in the online education space for more than a decade. We've been working very closely with Danny at the Evolution of Medicine to help us build out our online courses like the Practice Accelerator, the New Patient GPS, and the Membership Practice Builder. In this episode, we followed on from last week's Functional Forum and talked about the role of education in the future of medicine, and particularly the role of delivery of content. Danny introduces us to a great resource for practitioners who are interested in creating dynamic content. The book is available for download May 4th through May 8th at goevomed.com/teach. If you're listening to this podcast between May 4th and May 8th, go get it right now. We had a great half-an-hour discussion. Send us your thoughts and feedback! Download a free copy of Danny's book from May 4th through May 8th at goevomed.com/teach. This week on the Evolution of Medicine podcast, we take a look back at a very special presentation from Dr. Leo Galland from our 2014 Evolution of Medicine Summit. Our next Functional Forum is entitled the "Evolution of Primary Care", which will address the most significant way functional medicine can impact medicine as a whole... as an updated operating system for primary care. Dr. Leo Galland is one of the fore-fathers of the functional medicine operating system. Outside of this presentation on the first Evolution of Medicine summit we have also welcomed him to the Functional Forum stage twice. Some of his important contributions to medicine are concepts like "leaky gut", "dysbiosis" and "SIBO". But the most impactful change to the old system is the transition to patient-centered diagnoses. Medicine evolving from a doctor-centered structure to a patient-centered structure and this reflects Dr. Galland's unique contribution to the operating system. In this podcast, Dr. Galland addresses how this new model was developed and why it's such an important part of the evolution of medicine. This week on the Evolution of Medicine podcast, we hear from Richard Morris, CEO of Powell Metabolics. Powell Metabolics is an innovative wellness coaching program delivered in a physical therapy environment that started in Arizona and has the potential to expand across the country. This is part of a greater trend of functional medicine integrating with other "hands on" modalities like physical therapy, personal training and chiropractic. We think you'll be inspired to hear about their process, the results and how your practice could benefit. All the way through the Functional Forum and the Evolution of Medicine we've sighted the future of "primary care" to be enhanced through technology, the Functional Medicine operating systems, and coaching for behavior change and this is such a great example. One of the powerful tools that Powell has taken advantage is Nudge Coach, a behavior change technology we love. By taking advantage of their white label solution, they have a branded experience for their patients to use to track behavior change between visits. This week on the Evolution of Medicine Podcast, we check in with New York City Functional Forum Meetup hosts, Tracey Vincel and Patricia Ladis, founders of KIMA Physiotherapy and Wellness. They join us to share their meetup journey. This week on the Evolution of Medicine podcast, we feature Dr. Lise Alschuler. Back during our first Evoltuion of Medicine Summit in 2014, Dr. Alschuler presented "The Evolution of Oncology". As we prepare to refocus on this topic during the January 2017 Functional Forum, we take a look back at this special presentation from. She has incorporated the learnings of her own experience with cancer into her work with others facing the challenges of this disease. Is going the ‘natural route’ a wise move after diagnosis? This week on the Evolution of Medicine podcast, we begin a new series of podcasts called The Future of Health Coaching. In this series, we welcome leaders in the field who are taking the industry forward. If you've been following the Functional Forum, you know that we'd like to see a health coach in every practice. We begin this new series with Sandra Scheinbaum, PhD, founder of the Functional Medicine Coaching Academy. Sandy shares with us how health coaches contribute to the success of a medical practice and what roles they can play to connect with patients and the local community. She also provides guidance on how to transition to an integrative practice that utilizes a health coach. This week on the Evolution of Medicine podcast, we feature, authors, Glenn Sabin and Taylor Walsh. Their book is called The Rise of Integrative Health and Medicine: The Milestones - 1963 to Present. It features over 120 of the most significant accomplishments in the field during the last 54 years. Evolution of Medicine is proud to be among the chosen milestones. As we move to the end of 2016 and approach the new year, it's always interesting to look back and see what we have accomplished. We can move forward to 2017 and beyond with more confidence as we learn from the past and understand the impact of the milestones described in the book. You can sign up to receive a free copy of the e-book here. This week on the Evolution of Medicine Podcast, we continue our series on the value of the membership practice model as we feature tips and stories from practitioners who have successfully made the transition. We welcome Dr. Randolph James and Kevin Miller, partners in a practice called True Life Medicine in Woodland Park, Colorado. Dr. James and Kevin share with us their journey from being a traditional family medicine practice to a membership-based Functional Medicine practice. We learn lessons from their experience and are excited to hear more about how they were able to create their successful transition. This week on the Evolution of Medicine Podcast, we feature Wayne Dysinger, MD. Dr. Dysinger is a leader in the lifestyle medicine space and is actively building a membership-based practice for his new innovative clinic in California, Lifestyle Medicine Solutions. Dr. Dysinger has implemented many of the things we have suggested during throughout the Functional Forum. He's incorporated a membership program and fully embraces lifestyle medicine. He's implemented group learning and community outreach, and health coaches and tech tools are an integral part of the success of his practice. He talks about these strategies and more. Why Dr. Dysinger moved his Direct Primary Care practice into the Lifestyle Medicine realm and how do “support groups” fit into personal responsibility and health behavior change? The hybrid payment model that Dr. Dysinger chose for his new clinic and how he integrates this into his practice to best support his patients and his success plan. Why Dr. Dysinger believes membership-based medicine is key to success in a world where patients are seeking healthcare partners and advocates, rather than the old model of simply treating the sick. The Evolution of Medicine is excited to announce the creation of it's second course the Membership Practice Builder. Some of the most successful functional medicine clinics are employing different types of membership models to make it more affordable for patients and at the same time, guarantees income for practitioners. As ever, we have heard our our community of practitioners when they expressed great interest in learning how to to set up a membership practice model. Visit goevomed.com/mpb for more information. On this podcast Dr. Atkinson and James discuss the perfect first visit. How do we provide incredible care in the new functional micropractice model? How do we use the together most effectively to get the most engagement from patients? How do we engage patients into their journey? We address these questions and more. Bulletproof is introducing a brand-new training course for coaches interested in becoming a certified Bulletproof Coach. They are committed to supporting you in becoming a successful coach who has the skill and knowledge to support your clients in achieving their goals, realizing their potential and upgrading their body, mind and energy. This week on the Evolution of Medicine, we continue our series called The Future of Patient Compliance with Mac Gambill from Nudge Coach. Nudge Coach is lifestyle coaching software that aims to better connect practitioners with their patients. It allows practitioners to empower patients through online lifestyle coaching through technology in between visits. Mac shares how Nudge Coach provides an efficient and effective way to better coaching and accountability for patients once they step out of the doctor's office. If you've been following us for awhile, you know that we have now moved from the term "compliance" to "empowerment". In this podcast, we discuss the difference between the two terms and how we have evolved passed some of the old verbiage into a new relationship between the patient and practitioner. This week on the Evolution of Medicine Podcast, we welcome Dr. Peter Bongiorno, President of the New York Association of Naturopathic Physicians. For several decades now, the NYANP has been working towards getting NDs licensed in the state of New York. Their vision is to advance the access to and awareness of Naturopathic Medicine. They have come up with an innovative way to fund their efforts. On Sunday, October 2nd 9AM-6PM EDT, the NYANP will be hosting a conference accessible to you from anywhere in the world. Check out NYANP.com to register and for more details conference. Proceeds will help retain the lobbyists working towards the mission of licensed NDs in NY (and you get CEs!). This week on the Evolution of Medicine podcast, we welcome Functional and Evolutionary Medicine expert, Chris Kresser. His presentation on the myths of adrenal fatigue was one of the most well received featured presentations on the Functional Forum this year. He joins us on this week's podcast to talk about SIBO. Small Intestinal Bacteria Overgrowth - it's become a buzzword in medicine the past few years and Chris has been on the cutting edge of treating it. We'll be discussing the standard diagnosis, why it's problematic, and what we can do about it. There podcast has tons of value for practitioners who are on the front lines of dealing with a range of digestive and other related issues. This week on the Evolution of Podcast, we feature Dr. Joel Baumgartner and JR Burgess of Rejuv Medical as part of our Future of Patient Compliance series. At the corner of exercise and medicine, sits a huge opportunity to develop the health creation centers of the future. JR and Dr. Baumgartner have come together to create Rejuv Medical which allows doctors to incorporate medical fitness to their practices. It can be incorporated by all types of practitioners to complement their practices as a funnel to obtain new patients and bring value to existing patients. Listen and learn how the system can integrate into any practice model to improve patient outcomes. Make an undeniable difference in your community by helping to reverse chronic disease and, as a result, be the “Go-To” within your niche. On this week’s super valuable Evolution of Medicine Podcast, we welcome Dr. Joe Tatta, a doctor of physical therapy who has been treating chronic pain for 25 years. Dr. Tatta became uber successful with more than fifteen clinics, where he successfully introduced functional medicine in the treatment of pain. This podcast is LOADED with valuable info on the potential of a functional medicine micropractice focused on healing pain, as well as the language of pain and how to speak to your patients about it. The potential of a functional medicine micropractice focused on healing pain. The language of pain and how to speak to your patients about it. How chronic pain affects about 100 million people in the U.S. The brain is the cause of pain – what can we do to dampen that pain response? The epidemic problem with opioids and the CDC/NIH stance. With over 100 million people in the U.S. suffering from chronic from chronic pain, the opportunity to serve the world at large through functional medicine is profound – and the chance to add this successfully to your micropractice is clear. They have some incredible webinars coming up on SIBO and “Adrenal Fatigue”, as well as, a free guide to treating some of the most common conditions in a functional medicine practice. Make sure to check out www.goevomed.com/kresser for more information - and watch your inbox for other great trainings from the Kresser Institute. This week on the on the Evolution of Medicine podcast, we introduce a new innovation from the Evolution of Medicine called the Future of Functional in 5. This is a unique opportunity to share your story and message to the whole Functional Medicine community worldwide. If you've been following the Functional Forum, you know we've taken the show on the road to engage with as many members of our community as possible. As we bring the show to Chicago in September, DC in October, Miami in November and back to NY in December, the Future of Functional in 5 will give members of our tribe the opportunity to share and be heard. Watch some of the initial videos we recorded at Powder Mountain, Ut in early August. The episode of the Evolution of Medicine podcast is sponsored by the Kresser Institute for Functional and Evolutionary Medicine. Visit goevomed.com/kresser for more information. How will the XPill supercharge your practice? This week on the Evolution of Medicine podcast, we welcome back Evolution of Medicine co-founder Gabe Hoffman and executive coach and keynote speaker, Robert Richman. Robert is not a doctor, and what he does is not strictly medicine, but he has created something called the Xpill. It's not a supplement or a prescription, but it seems to have incredible powers to create transformational change. It encompasses looking at placebo response, coaching, group structures, intention setting for patients - you'll find out why this is so interesting to the future of medicine in one of the most fascinating half hours of this podcast we've ever had! This week on the Evolution of Medicine Podcast, we feature Naturopathic doctor and IFM faculty member, Dr. Kara Fitzgerald. This is the 2nd of two podcasts about methylation. Dr. Fitzgerald has just written a new book on this popular topic and any practitioner looking to help their patients most effectively will want to listen. The “dance of methylation” extends far beyond supplementing with B12 and methylated folate. Indeed, long-term outcome studies using this approach are lacking, and research suggests caution is advised with regard to imbalanced hypermethylation. However, much can be done to safely support methylation balance. Methylation Part 1: Why all the hype? This week on the Evolution of Medicine podcast, we feature Dr. Ben Lynch, President and CEO of seekinghealth.org. Dr. Lynch is a Naturopathic Doctor who currently researches, writes and presents worldwide on ta range of topics. He's passionate about teaching doctors and other practitioners about disease prevention and health promotion. One of the buzzwords in the integrative / functional medicine space in the past few years has been methylation, so much so that whole conferences are now dedicated to it. Are you familiar with MTHFR mutations? Chances are some of your patients are. In this episode we take a dive into these new areas of medicine with Dr Lynch. This week we welcome back Dr. Pamela Wible. Last year she joined us on our podcast to speak to her practice evolution from a "production line" to a "relationship medicine" practice in our Micropractice Evolution series of podcasts. You can listen to it by clicking this link. This week, Dr. Wible joins us to talk about the epidemic of physician suicide. She's filmed a powerful TedMed talk on the epidemic of physician suicide where she read the words of physicians on the edge of taking their own lives. As we lose more brilliant minds and healers to suicide, Dr. Wible has started a project to bring this epidemic to light. Her film called "Do No Harm" will do exactly that and she tells us more about the film and how we can support the movement. the genesis of Dr. Wible's Kickstarter "Do No Harm"
This week we bring back Jenna Arnold from Organize. A few months ago, we featured Jenna as an innovator in the organ donor industry. She's leading the charge to solve the shortage of organ donors in the next two years by using technology to her advantage. Last time we featured her, the Evolution of Medicine community showed support and interest that made a real difference. Thank you! We bring her back this week to share an update about Organize. She and her team were recently at the White House to speak about their project with some important influencers from the industry. She shares with us what she learned and what they were able to accomplish. This week on the Evolution of Medicine podcast, we welcome back Dr. Robin Berzin. The last time she was on the show, we featured her on the podcast New Models of Functional Medicine. She had just opened up her membership based direct primary care Functional Medicine practice, Parsley Health, in New York. We've brought her back because her practice is now a huge success. She's implemented many of the things that we speak about in the 60 Day Practice Accelerator program and the Functional Forum. James, as a member of her practice, has witnessed it firsthand. Dr. Berzin is now opening more practices and looking for more physicians to bring on board. If the membership model and Dr. Berzin's practice inspires you, check out the membership model course we're offering at the end of July in Salk Lake City. It's a much more efficient way to capture the value of what you provide in Functional Medicine and it makes it much more affordable for patients. Click here for more information. Twice a year, Evolution of Medicine founders Gabe Hoffman and James Maskell record a podcast called "State of the Evolution" charting the progress of the last six months and looking forward to the next. Since our last address Thanksgiving 2015, so much has happened, and we hope you enjoy the wrap up. We hope you enjoy this episode and share it with another practitioner. Thanks so much for all your ongoing support and our mission is built on your success. for practitioners to keep in touch with their clients or patients in between visits, particularly, to create behavior change. This week we feature Maneesh Sethi, the CEO of Pavlok. Pavlok vibrates, beeps, and releases an electric stimulus that ranges from pleasant to aversive to "shock" you into behavior change. Welcome to the Evolution of Medicine podcast. There has been a lot of discussion, recently, of the opioid issue in America and some of the new CDC guidelines. We reached out to a reformed pain specialist for his unique perspective. This week we feature pain management specialist, Dr. Kevin Cuccaro. He's been on a mission to understand the causes of pain and has gone from being an anesthesiologist to an integrative medicine practitioner. He shares his pain medicine journey and what he's learned along the way. This week, we feature food mood expert, Trudy Scott. She's a certified nutritionist and on a mission to educate and empower anxious individuals worldwide about nutritional and natural solutions for anxiety, stress, and emotional eating. She came to our recent Functional Forum in San Francisco and afterwards approached us with some great ideas about how we can make the Functional Forum more approachable for those with social anxiety. If you've seen the forum, you know that Gabe and James are not introverted by any stretch of the imagination, so, it was great to learn from the experience of others. For more than a decade, Naturopathic Doctor News and Review (NDNR) has been a central education platform for the naturopathic profession, both in print and online. Back in 2011-2013, our founder, James Maskell, wrote a practice development column for the platform. This week NDNR.com launched its first Online Summit on Cancer Prevention and we couldn't be more excited to partner with them. If we truly want to be successful in cancer prevention, some of the underlying foundations of Naturopathic Medicine, like the "Therapeutic Order" are a key part of an optimal plan. We welcome their founder and publisher Razi Berry for a great discussion relevant to any practitioner in integrative, functional or naturopathic medicine... or what we like to call the "kNEW medicine". For this week's EvoMed News Videocast we welcome a special guest, game-changing physician and best-selling author Dr. Lissa Rankin. This week we discuss the new research that confirmed what many of us had known for a decade... Iatrogenic Disease (caused by doctors and medicine) is the third leading cause of death in America. It was a fascinating 20-minute segment, make sure to check it out! This week we feature the work of Niki Gratrix. She's an award-winning international renowned registered nutritionist and health writer specializing in stress and optimizing energy. In 2005, she founded one of the largest mind-body clinics in the U.K where they specialize in chronic fatigue syndrome. We connect with Nikki to speak about ACE score (Adverse Childhood Experience). It plays a significant role in health and Niki has a great track record of working with ACE scores. She's got some interesting ideas about early life stress and trauma and how it triggers chronic disease later in life. Ever since we saw her first TEDx talk, we have been huge fans of Dr. Lissa Rankin here at the Evolution of Medicine. Her story is such great example of the vision we have for changing medicine. She is the author of two best selling books, Mind Over Medicine and her recent "Anatomy of a Calling" where she describes the hero's journey necessary for anyone to follow their calling in life. In this episode of the podcast, Dr Rankin describes her hero's journey from medical school to "psycho-spiritual" medicine and what she has learned along the way, and the story is equally inspiring for doctors looking to rediscover their passion for medicine as it is patients looking to discover health. Welcome back to the final podcast in this series on "The Future of Patient Compliance" where we have been documenting the technologies and strategies fueling the empowerment revolution. Whereas most of the technologies have focused on either training systems or practice based technologies, this week we introduce our first consumer product. Having polled our community, we asked what are the technologies you use to empower the patient between visits. The answer was HeartMath. HeartMath has been used by over 5 million people and is recommended by 25,000 health professionals around the world. Evolution of Medicine co-founder Gabe Hoffman used it successfully in his NYC practice for years. In this episode we interview Dr. Tim Culbert a developmental and behavioral pediatrician from Minnesota who has been using the technology with great success for more than a decade. Welcome back to our popular podcast series entitled "The Future of Patient Compliance" where we document the journey from compliance to empowerment as medicine shifts from a patriarchal model that was a good fit for acute disease, to more of a nurturing, community model that is more suited to chronic disease. One of our first sponsors on the Functional Forum was Freedom Practice Coaching, who have bemuse the biggest company in the industry for helping doctors transition to a more suitable model for chronic disease care. We have shared some of their best strategies on previous podcasts, but this week we talk about a different area of compliance.... doctor compliance. How compliant are you with what you need to do to improve your practice? If you are asking patients to change behavior or make investments into their health, how do you comply with your own areas of weakness? In this podcast we speak with Deborah Matthew, MD a physician leader from North Carolina who speaks openly about what it really took to build a successful practice model, from being just busy to building a profitable, efficient practice. Freedom Practice Coaching is excited to announce they have a new weekend program to teach practitioners their lead flow and packaging system and have them leave with a 90 day plan to implement. The Functional Forum and Evolution of Medicine community can sign up at vastly discounted rates until the end of April. Welcome to our news podcast for April 16th 2016. Each week we look at the stories that are important to the integrative medicine community. Thanks to our sponsor, MBODY360​. Find out more about their adherence and plan delivery app at www.goevomed.com/MBODY. Please send us your best news stories to news@goevomed.com and feel free to share this with colleagues. We have been thrilled at the feedback from our community from our "Future of Patient Compliance" series, where we have started the conversation about how we can shift the conversation on "compliance" to "empowerment" and see how technology can best help us to scale and automate that transition. More than any other podcast in this series, we are thrilled to bring this interview to you. One of the main reasons for this is that the Functional Forum had a role in bringing this technology into the world. One of our goals at the Forum was to bring together technologists and Functional Medicine doctors to see how those collisions could lead to solutions for our community. If you have been following the Forum you know about MBODY360, an app that creates a new level of engagement between patient and practitioner. In this episode you will hear from Kari Thorstensen, the creator of the app, and Dr. Vincent Pedre, Functional Medicine physician and digital innovator. When we started this "Future of Patient Compliance" series, marrying the shift from compliance to empowerment with the technological tools to accelerate it, Kyle Braatz, the CEO of Healthwave was our first guest on the first episode. A year later, Healthwave has undergone a transformation to Fullscript.com. As we find out in this podcast, this is more than a branding change, this represents a massive upgrade in their service, not only adding full online and offline integration of inventory, but not the availability of all product lines on the platform, making it truly brand agnostic. Welcome to our video newscast for April 2nd 2016. Thanks to our sponsor, MBODY360. Find out more about their adherence and plan delivery app at www.goevomed.com/MBODY. We are thrilled to welcome back our most popular podcast series "The Future of Patient Compliance" where we talk to technologists helping to solve problems in medicine, specifically those charting the shift from "compliance" to empowerment. This week we feature a real mover and shaker, Jenna Arnold, co-founder of ORGANize.org, a technology start up aiming to solve the complex problem of organ donation forever in 4 years. As audacious as it sounds they have made amazing progress in the last to years and are under a month away from a major White House policy announcement. In this week's episode we announce a new regular segment for the news. The last Saturday of each month we will do a new spin on the news called "Charting the Convergence", discussing specifically how the practitioner community is converging to make maximum impact in medicine. Choosing the stories and joining us each month will be John Weeks, journalist, campaigner and chronicler of the movement for more than three decades. John Weeks is a chronicler, speaker, change agent and executive with three decades in leadership of the movement for integrative health. He works at the convergence of that historic trend with the medical industry’s recent engagement with creating health. John has consulted and presented with multiple major health care organizations – among these the NIH, WHO, AHA, AAMC, IOM, and APHA – and numerous other academic and professional organizations. He helped found key collaborations in the field including the Integrative Health Policy Consortium and the Academic Collaborative for Integrative Health. John’s writing appears regularly at the Huffington Post, Integrative Practitioner, Integrative Medicine: A Clinician’s Journal, the Integrator Blog, and elsewhere. He speaks regularly on the movement's evolution, core challenges and opportunities. He attended Stanford for 3 years, studying history. Four institutions have granted John honorary doctoral degrees. Seattle-based, Weeks feels particularly lucky to have worked 6 of the past 15 years from Costa Rica, Nicaragua, and Puerto Rico with his spouse and their two children. Welcome back to the Leaders of the kNEW School podcast series where we speak with female leaders in medicine who are bringing their feminine qualities into healthcare. This week, I speak with my friend, JJ Virgin. She is a celebrity nutritionist and NY Times best selling author. She, also, organizes The Mindshare Summit where she brings health entrepreneurs together into one room to brainstorm ideas to make everyone's ventures more successful. In this podcast, she speaks to the importance of collaboration versus competition and how healthcare providers can start collaborating and leave the competition model behind. What is the Health Mafia? Which event will James be speaking at in August?